The Book of Mormon opened to a sold-out audience in Indianapolis this week and it continues that rare status throughout its run at Old National Centre. In fact, the only thing that surprises me is Broadway in Indy didn't realize its potential and originally schedule more shows or add on performances. There are shows which are carried by the story line and writing quality; others by the sheer talent of the performers. Then there are those that bring IT from the talents of every factor: acting, directing, writing, music, choreography ~ all of it comes together to bring the show to the elite status of a must-see show. The Book of Mormon accomplishes that and more...it was a pure delight to watch. The entire audience was rocking with laughter all night as the top-quality performers burst from their seams with energy, enjoyment and rock-solid talent. There is no way to fit all the names that should be in this review, unfortunately, as they do deserve mentioned. 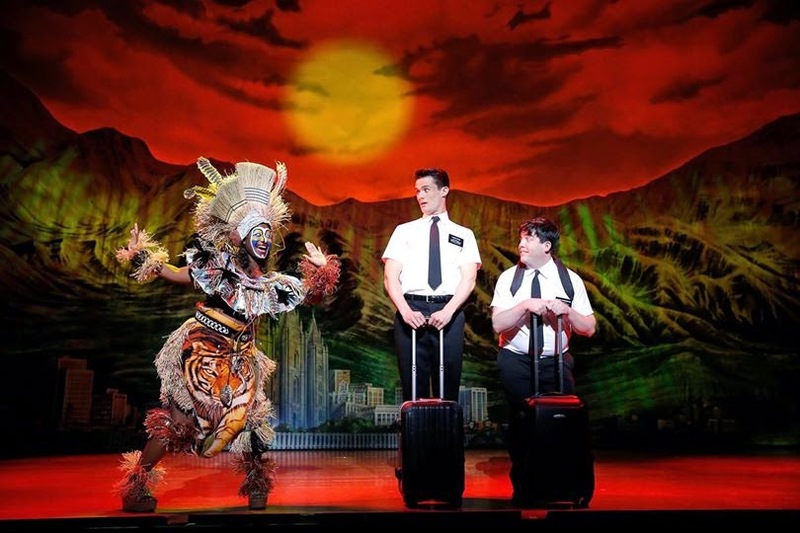 I will not put out a spoiler with the plot, but know if you (and who hasn't) have had one too many pairs of Mormons approach your door with that zealous speech ready to give you help in finding their religion, you will be howl with laughter at this Broadway phenomenon and Nine-time Tony award winner. Christopher John O'Neill EXPLODES onto the stage with all the enthusiasm of a 10-foot, 400 pound orangutan and the adorability factor of the entire Little Rascals Gang. Brilliantly portraying Elder Cunningham, positive of what he is spouting one moment then flipping to the clueless way he actually feels underneath then immediately transforming into a child needing love and attention (lots of both) ~ O'Neill sets a level of energy that would require the average person a dozen highly caffeinated drinks to accomplish. It is no doubt this will not be O'Neill's last professional stage performance, although it was a complete shock to find out this was his debut. 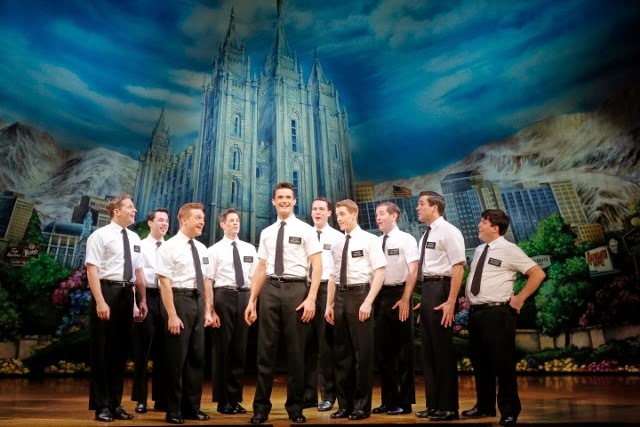 Elder Price, the new recruit who believes he is incredible and meant for greatest of all things, like living in Orlando, is portrayed by Mark Evan. Evan is able to convey a vulnerability within the pompous attitude of his character who believes that he is a higher quality Mormon than all of his counterparts and ready to excel at being No.1. His insecurity shows when he finds himself out of element and not the wonder recruit he believed himself to be. this week in Indianapolis, well, may God ~ or Joseph Smith ~ have mercy on your soul. Elizabeth J. Musgrave writes two magazine food and wine columns: Destination Dining and White Linen & Corks,and is a travel, features, food and wine writer, travel and food photographer, and performing arts and restaurant critic. Catch her as the Travel & Leisure Adviser on FOX59 Morning News Show. She also is a speaker, consultant and trainer for businesses, media, P.R., and tourism groups, as well as a radio and television guest and host. Read Infused, her spirits, wine & beer lifestyle column, at www.GottaGo.us and www.FoodDigital.com. Follow her on Twitter @GottaGo, LinkedIn and Facebook. either walking about a cruise ship, racing to see all family members or, perhaps it was a business trip and you need to relax before returning to local work mode and family duties. Generally for me it entails a breakneck pace participating in, attending and trying as much as I can so as to report back to you. Kind of like the first guy across the ice before everyone else attempts it. Or the one who tastes the hot sauce first then cautions the others. Either way, I love it and upon returning home, I like to take a day or two, when possible, to let the world I just left swirl through my mind and see which ones are the ones I recommend the most. 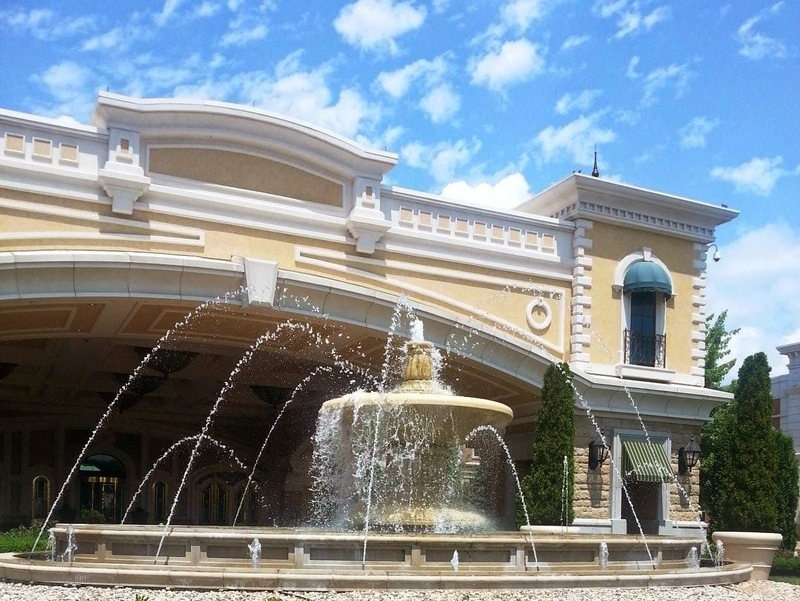 Here is the list for River City Casino and Hotel, located in St. Louis. This is to-do list No. 1 for a reason. I have never seen anything like this anywhere else. 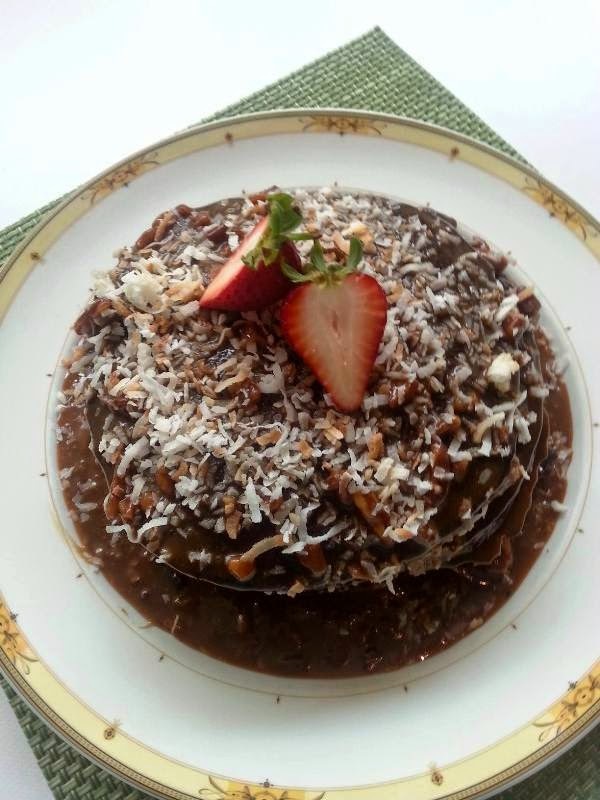 Available at Lewy Nine's, no way will you eat this all by yourself, so be prepared to share with tablemates, onlookers and complete strangers as this is a showstopper dish. 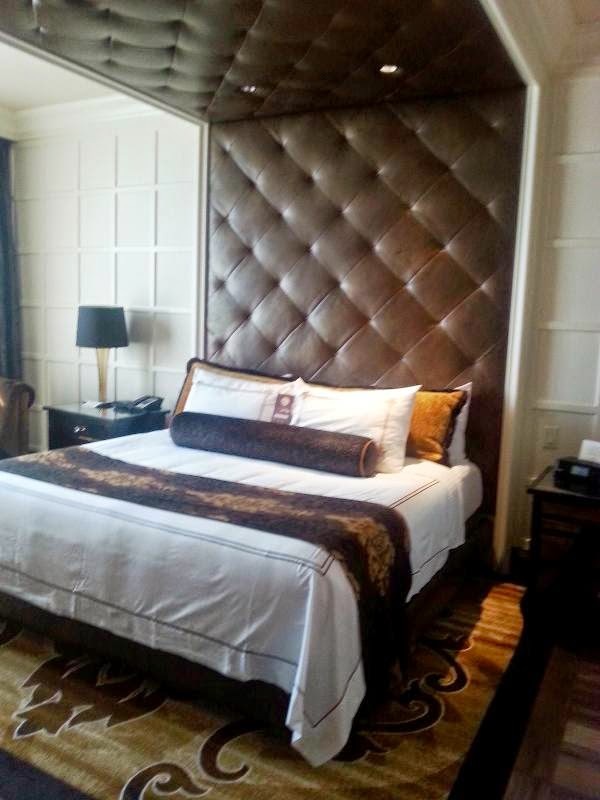 If you do not believe these hotel rooms are worth the drive alone, we need to talk. It's a must to experience the Director Suites, with amenities such as glossy magazine-level bedroom, sitting room and.... those bathrooms, wait until you see those. No, you are not the smelly kid, which is a good thing because the shower is big enough for you and four of your closest friends in this spa-like retreat. 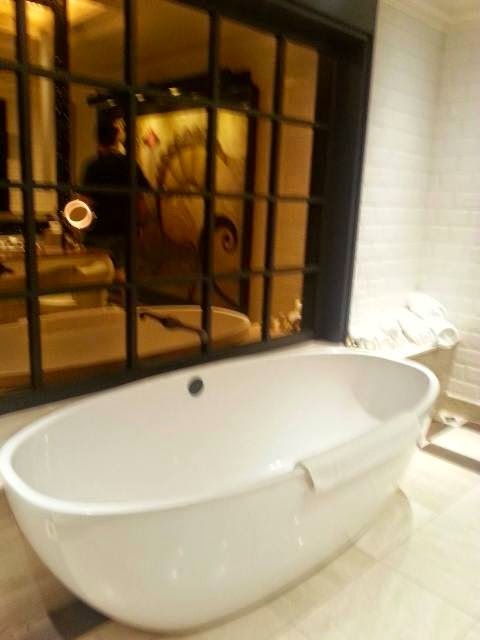 The tub is a romance-inspiring deep soaking joy just waiting for a couple to slip in and enjoy a Hollywood movie moment. Although there is more than enough to keep busy without stepping onto the gaming floor, go ahead and hit the slots (more than 2000), and throw some dice. There are live dealers (55 tables), which is always more enjoyable, and the top-end venting system makes any nearby smokers a complete non issue. The free app was so helpful in checking out the entertainment calendar, menus, and a map to keep you going in the right direction. But don't wait until you're there to download it ~ it's great ahead of time for reservations and more. Click here to download. 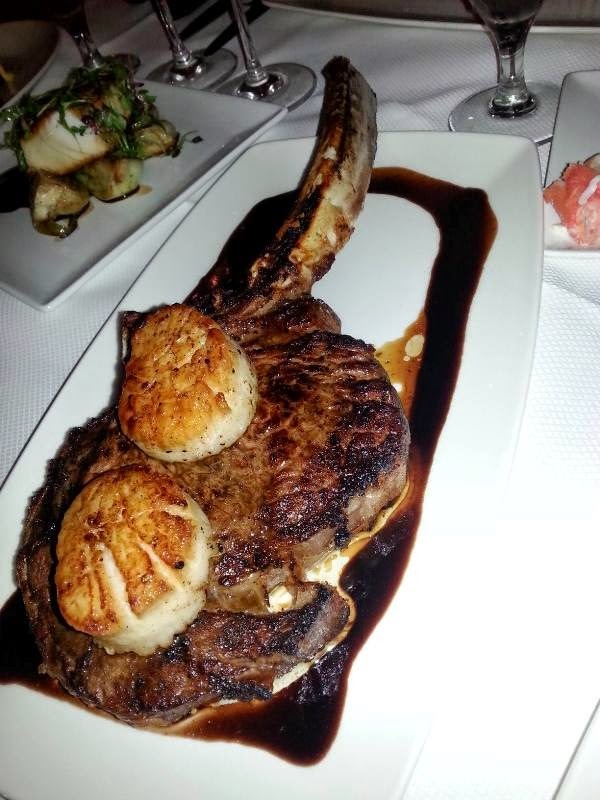 A great ice breaker meal with friends, coworkers or family and found by order at 1904 Steakhouse, Let them know when reserving a table that you want the 44 oz. prime ribeye and the optional 8-10 lb. lobster and your group will have plenty to enjoy. I mean it... walk throughout the property enjoying the beautiful design, water fountains and other ooh and aah factors. This is not just another casino, folks. I have seen a few in my travels, and this one blew my mind that it is not located on the Las Vegas Strip. I am not in the convention-booking field, nor do I set up catered affairs, but if I did ... this is the place dreams are made of. I was priviliged to try out many items from their customizable catering menu and was impressed with how many could be served without losing quality, pricing or flavor. The ever-changing schedule makes me believe they truly care what their patrons want. It varies with boxing, music of all genres and other shows to keep it fresh. Click for schedule. 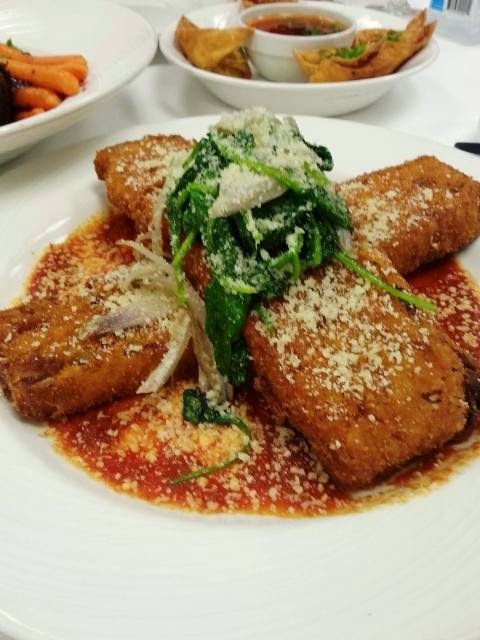 Seriously ... with St. Louis as the home to toasted ravioli, Executive Chef John Johnson uses his mad culinary skills (and I do mean over-the-top mad skills) to twist things up with this Beerhouse dish. Click here to watch his video on making it at home. Ahhhh yes indeed... it is that time of year again (thank goodness after this long, harsh winter). 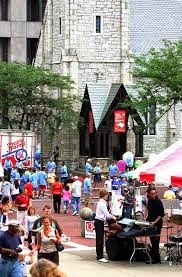 And nothing says summer like the festivals in, and around, Indiana, including the Christ Church Cathedral Women's 49th Annual Strawberry Festival. They represent a beacon of light showing us that the long, harsh winter is finally behind us. And... we like them every way we can get them: straight from the garden, pies, cakes, with sugar, in fruit salads and every other concoction. But, perhaps most of all, we like strawberry shortcake. And the annual Monument Circle event has been around, seemingly, forever, to most of us. Every year, hundreds of volunteers, church, civil, celebrity and media, line up to scoop, dish and hand out thousands of strawberry shortcakes. I like that. The volunteers, the food and the continuity of the event, not altering the great menu and keeping the price incredibly reasonable ~ $7 ~ (especially considering it is for non profit groups) which means we can get more than one and feel good helping others at the same time. A win-win for everyone in my book. When is the strawberry festival? Thursday, June 12. It runs from 9 a.m. through 6 p.m., but to-go orders can be scooped up (get it?) beginning at 8:30 a.m. in the basement of Christ Church Cathedral Don't wake me, okay? I will be there later, but not too late because when supplies run out, they are done for the year. And, there is not much more disappointing then your taste buds being robbed of something yummy. Once again, it is a cash only situation, but and ATM will be onsite for those who forget. Live entertainment begins at 10 a.m. this year. Christ Church Cathedral Women has hosted the Strawberry Festival every summer since 1965. 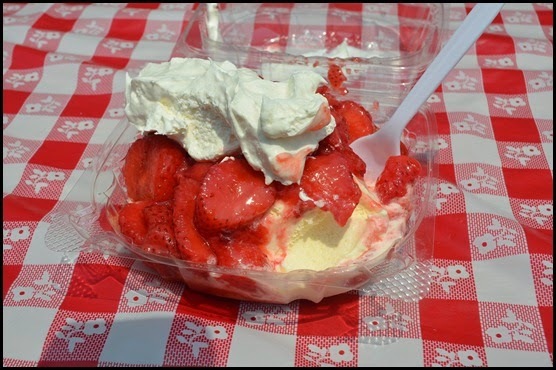 More than 300 volunteers will be on-hand to serve an estimated six tons of strawberries and 18,000 homemade shortcakes. Festival proceeds benefit local, national and global nonprofit organizations through bi-annual grants. Christ Church Cathedral is the cathedral church of the Episcopal Diocese of Indianapolis. Christ Church Cathedral is located on Monument Circle at the center of Indianapolis. The Cathedral is the oldest building on the Circle and the oldest religious building in continuous use in Indianapolis. Christ Church Cathedral has a strong commitment to serving the needs of others and is actively involved in mission work locally, nationally and internationally. I always like hearing about new ideas, especially those including wine and chocolate. 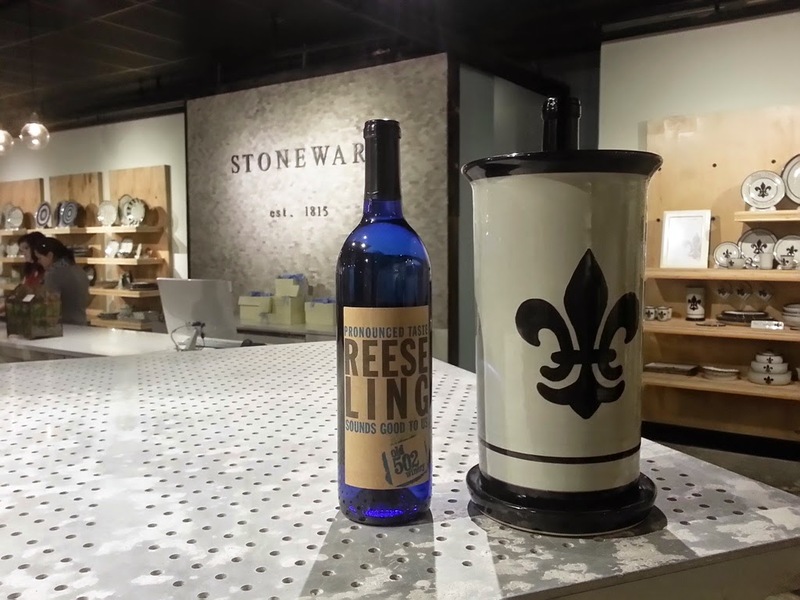 Stoneware, Louisville's premier pottery and stoneware makers, is showcasing Kentucky wine maker, Old 502 Winery, and chocolatiers Cellar Doors at its Third Thursday Lifestyle Series. The wine and chocolate pairing features products by two Kentucky Proud members. The free event runs from 5-7 p.m., Thursday, June 19. 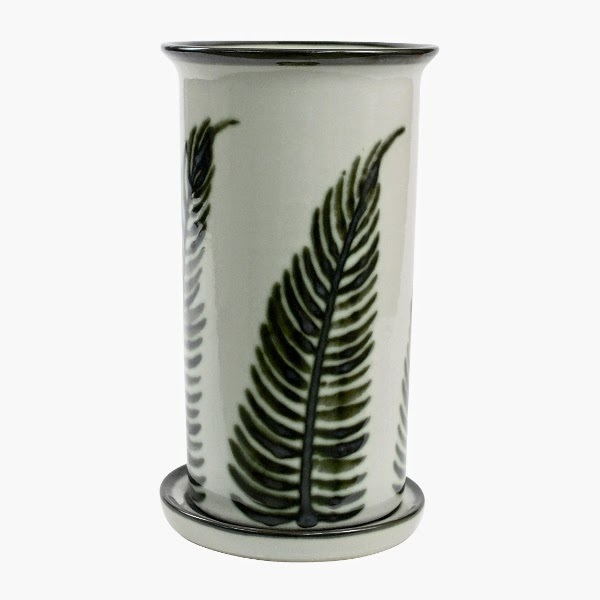 The Lifestyle Series is designed to showcase authentic, local makers of products that complement the Stoneware products and lifestyle. 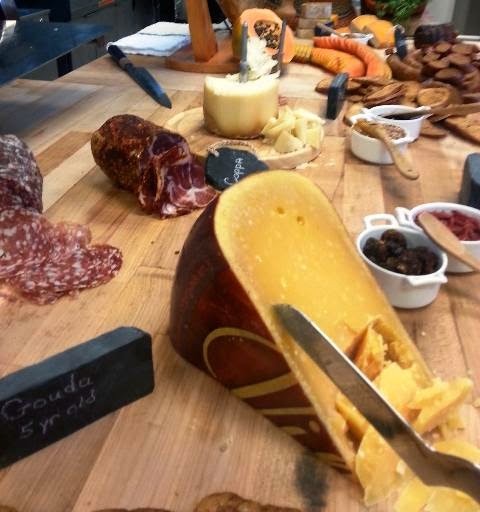 Attendees will have the opportunity to meet Logan Leet, owner of Old 502 Winery, and Erika Chavez, owner of Cellar Door Chocolates, who will explain their processes. Stoneware staff will be on hand to answer questions about products including their new Stoneware Wine Coolers that can be stored in the freezer and used to keep wine chilled. 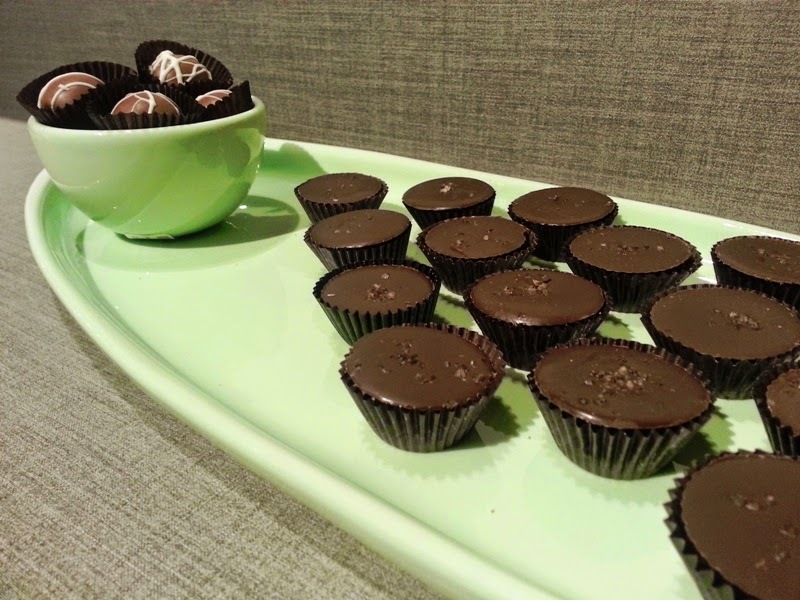 Since 2007, Cellar Door Chocolates has been sourcing the finest ingredients and creating unique flavor combinations in handmade truffles, butter creams, sea salt caramels and small batch bourbon balls among other chocolate treats. Kentucky Proud is the state’s official farm marketing program. The Kentucky Proud logo stands for food and farm products raised, made or processed in Kentucky. The 15th annual Vintage Indiana Wine and Food Festival is set to take place in Military Park Sat., June 7. Hours of the event are Noon to 6 p.m. These are new hours, so be certain you buy bottles to take home early. More than 300 wines are available for sampling, buying to enjoy onsite or take home. The first 10, 000 adult-sampler tickets with I.D., receive a commemorative etched wine glass. I get one every year and enjoy collecting them. I do wish they would make each year a different design just for fun. A children's area with KidZone interactive play equipment will be open. Vendors, food concessions and musical entertainment are available throughout the event. Music headliners include Jennie Devoe, My Yellow Rickshaw and Zanna-Do!. Although outside coolers, beverages and food are not permitted,visitors are encouraged to bring lawn chairs and picnic blankets. For the cost, and to purchase advance tickets, visit Marsh Supermarkets or click here. Elizabeth J. Musgrave writes the food and wine columns: White Linen (Retirement Living magazine) and Destination Dining (M magazine), is a fine-living, travel, food, wine and spirits writer photographer, and performing arts and restaurant critic for Gotta Go. Catch her as the Travel & Leisure Adviser, WISH8 (CBS) on FOX 59 Morning News Show. Read Infused, the spirits, wine & beer lifestyle column, at www.GottaGo.us and www.FoodDigital.com Gotta Go is published on www.Gottago.us, and in magazines. Follow her on Twitter @GottaGo, LinkedIn and Facebook.